We are well into the holiday shopping season and if you’re anything like us, you’re staring down some names on your list who are notoriously hard to buy for. What do you get the person who has everything, or what can you grab as a backup gift for unexpected guests or hosts of last minute parties? Max likes to plan ahead, while Miles is always prepared for the unexpected by not expecting things to go to plan at all! Whether you’re a Max or a Miles, we’ve got you covered with these no-nonsense gift ideas for everyone on your list. 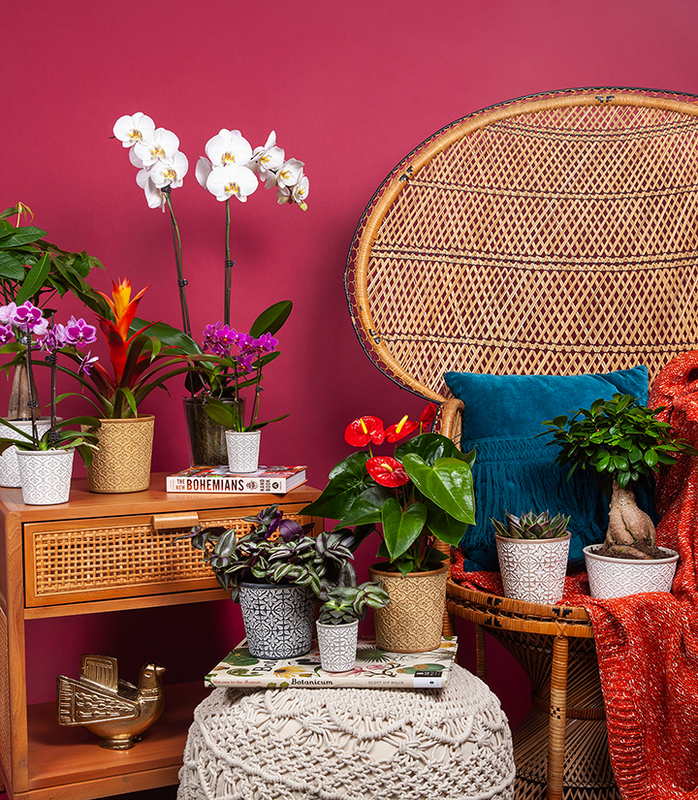 Houseplants make the perfect gift because they’re perfect additions to any home! They help purify the air, boost mood and productivity, and make people more happy. Plus, you can’t deny they’re easy to buy. Just stop by your local H-E-B to check out our selection! We always have a variety of foliage, succulents, orchids, and more, plus rotating special varieties like waterfall orchids, anthuriums, and items from our Select Foliage line. This month, we’re also featuring planters in select stores, with multiple orchids or succulents. First of all, identify if the person on your list is definitely a plant person or if they’re a plant person who doesn’t know it yet. Meaning, they think they don’t have a green thumb, they killed a plant once and never tried again, or they’ve never tried to keep a plant at all! We have plants that even a certified brown thumb can care for. Secondly, note if the person has pets or not. If they do, choose a pet friendly variety (check out our blog post about pet friendly options to learn more). If they don’t have pets, choose whichever plant suits them best when you’re in the store! If you need a little help deciding, think about your friend when you take the Max or Miles personality quiz to get an idea of which type of plants might suit them best. Max’s orchids are easy to care for with their simple watering instructions. Just three ice cubes once a week keeps the 5” orchid happy and healthy, blooming for months. Pay special attention in store this month, since we have the beautiful waterfall orchids available! Mini orchids also make an easy gift to grab as a quick stocking stuffer. All of our Phalaenopsis orchids are pet friendly so they’re a go-to gift item for holidays, birthdays, and more. The bright red blooms of the anthurium are perfect for adding a touch of holiday cheer. Anthurium is the longest blooming plant and will bloom continuously when cared for with its simple instructions: six ice cubes per week. We recommend skipping the anthurium for pet owners, since its leaves and blooms are toxic to people and pets. This variety of foliage from Miles’ collection is perfect for nearly anyone. It’s so low maintenance, it can go for weeks between waterings and still thrive. While technically classified as toxic by the ASPCA for cats and dogs, it tastes pretty yucky and pets tend to leave it alone. But if your giftee has very curious pets, maybe skip this one. Pothos is another low maintenance foliage option with beautiful trailing vines and wide heart shaped leaves. It’s NOT pet friendly, so gift your buddy a plant hanger to keep it up high, or gift it to a person without pets who tend to chew. Pothos is easy to care for because when it needs water, it starts to droop and look a little sad. A quick drink will perk it right up! This friendly little plant has attractive variegated leaves and it’s a pet friendly foliage option! Another low maintenance plant perfect for newbies and experienced green thumbs, the peperomia (or “baby rubber tree”) does great in the home or office, so it’s great for a coworker or boss. This hardy succulent can handle being basically ignored, which is great for someone who loves the idea of plants but isn’t sure about their nurturing skills. Haworthia is one of our pet friendly succulents and has a beautiful white striped pattern that makes a great addition to a table, shelf, or desk. Plus, it comes in a cute mini size too! When you stop in and see us, take a photo of your favorite plant in store and tag us! We’re @maxandmilesplants on Instagram and we love seeing (and sharing) your pics. Happy holiday shopping!